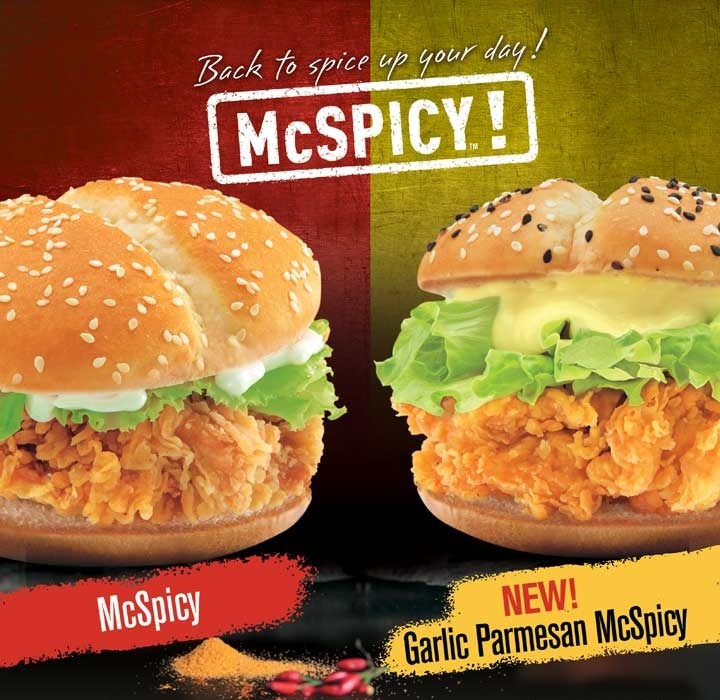 McSpicy is back with another kick!!! In case you haven't heard, or maybe you just came back from another planet, yes the McSpicy is back and in more ways than one! Want something to spice up your day? Then you got to get yourself some McSpicy! This time our McSpicy did not come alone, and is prepared for you more spicy ways to let your enjoy that crisp chicken patty with a kick! Presenting the McSpicy and-the NEW Garlic Parmesan McSpicy! It’s the same thick, juicy McSpicy chicken burger that’s spiced just right but now smothered with a delicious garlic parmesan sauce, sandwiched in a toasted black and white sesame seed bun. This new McSpicy variant is the right amount of tangy and spicy that will leave you coming back for more! These deliciously spicy chicken burgers are available for a limited time only, so better hurry and get them while you can! Enjoy your original McSpicy or Garlic Parmesan McSpicy with McDonald’s World Famous Fries and the NEW McFreeze in Frozen Dalandan, now available in all McDonald’s restaurants! Act now and bite into the spicy and crunchy chicken burger goodness when you dine in on regular hours at McDonald’s restaurants nationwide. You can also have your McSpicy fix via Drive-Thru or McDelivery by dialing 86-2-36, visiting www.mcdelivery.com.ph, or using the McDo PH app. Tell your friends and loved ones about McDonald’s McSpicy and Garlic Parmesan McSpicy! Share your photos on Facebook, facebook.com/McDo.ph or tag @McDo_PH on Twitter or Instagram.